Are you someone who rings in the New Year with special traditions? Taking a dip in the freezing water of the Baltic or the North Sea on New Year’s Day? Perhaps you attend a New Year’s concert or work off the Christmas calories with a long walk? Many of us find ourselves looking back on the year at this time, but we also take the opportunity to think of new wishes and hopes for the year to come. GfK Compact is now tackling a subject that barely anyone else is thinking about during this period, in what seems to have almost become something of a tradition in January. What will people be particularly focusing on in 2018? Which values are becoming more important for society and individuals, and which are losing relevance? Once again, security is number one in this year’s survey. A large majority of respondents still think that this value is becoming more significant, not just for them personally, but also in a more general sense. In previous years, respondents have regularly assigned increasing importance to the issue of security, and it is little wonder when you skim through the end-of-year reviews in newspapers and magazines. Once more, terrorist attacks and simmering international conflicts clearly serve to validate the sense of a lack of security among many people. Almost 80% perceive this as a value of the future too, while only 3% believe that this is less important nowadays. The other 19% are of the view that the relative importance of security will remain stable. 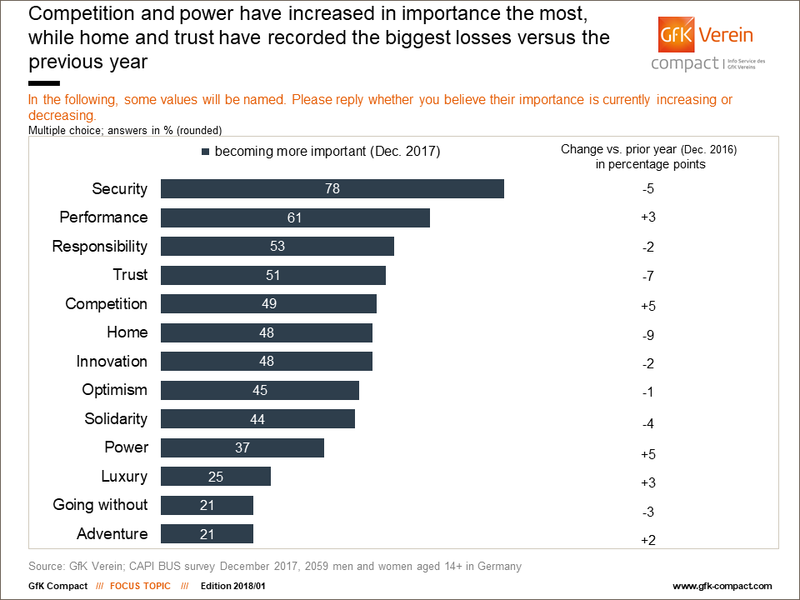 This has been revealed by the results of the GfK Verein’s most recent study on the topic of changing significance of values, in which more than 2,000 people aged 14+ (representative of the German population) were again interviewed at the turn of the year. These respondents assessed whether the relevance of 13 predefined concepts or values was currently increasing, decreasing or set to remain stable. Lagging a fair way behind in second place in the rankings comes the subject of performance. In total, 61% of respondents evidently do not like to do things by halves, see performance as a value for the future too. Only 4% disagree with this. The concept of resolutely tackling tasks and making an effort in future too would appear to come from a feeling of great responsibility. As such, more than one in every two respondents believes that taking responsibility is particularly important in this day and age. Just 5% see things differently. Trust and competition round off the top five values, although at first glance these values would appear to be contradictory in nature. But why shouldn’t we face small and large tasks alike with more confidence in order, for example, to bag that sought-after job and prevail against our competition? With this in mind, a similar number of respondents – 51% and 49% – cite trust and competition as values of increasing importance. However, there are also a handful of dissenting voices here. In principle, one in ten respondents still view “increased competition” as something that is not relevant for the future. The middle ground of the rankings is made up predominantly of social subjects: home, innovation, (both 48%) optimism, and solidarity (45% and 44% respectively). Moreover, the respondents were in strong agreement overall regarding these themes, with only a few people disagreeing. However, there is one exception: 11% of respondents believe that solidarity will lose importance for society in future. Perhaps these are the same people who opine that power is a value that will come to play a more significant role: 37% think that this is likely, but just under one in every five have the opposite opinion. 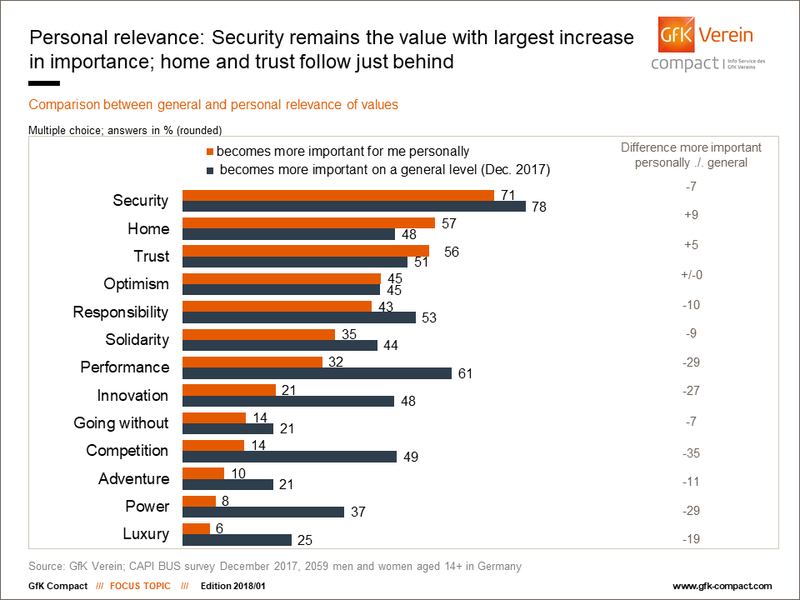 The skeptics are even in the majority for luxury, adventure, and going without: Respondents who believe that these three values will decrease in relevance outweigh those who take the view that they will become more important. This puts these topics at the bottom of the rankings. Our own experiences, what we read and what we hear all influence our value concepts. As such, the ranking of values is not fixed – it changes according to current events. However, some aspects have remained stable compared with the previous year: As before, security ranks in first place. Nevertheless, for the first time in years the number of people who see this as a significant value is decreasing. Has the situation in Germany actually relaxed that much? Or are we just getting used to the negative headlines? Whatever the answer to this question may be, a year-on-year comparison does reveal that solid values such as home and trust have been hit the hardest: Declines of nine and seven percentage points respectively were recorded for these values. One explanation for this could be the positive economic situation: Those who believe the economy to be stable and who do not have any worries about their job or finances are sure to be more optimistic about the future and probably barely ever experience a crisis of confidence. They presumably also tend to shy away from cocooning, in other words, retreating into the comfort of their own four walls. Clearly, people want to enjoy themselves instead, and they will make an effort to do so too. As such, both performance and luxury increased by three percentage points, with power and competition even gaining five percentage points each. This actually brings the issue of competition into the top five, despite languishing in a rather average ninth place last year. Does this mean that 2018 will be a year characterized by fierce competition, power struggles and searching for motivation? Perhaps we will sit safely in our houses and mull over the best way to get ahead of the competition in the workplace or how to complete even more work in a shorter space of time. Au contraire; in fact, a glance at the figures for personal relevance regarding the 13 values reveals that there has been little correlation between the concepts we see as generally being future-oriented and our personal convictions for quite some time. The subject of security remains in top place here too, with 71%. However, the increase in importance is viewed as slightly higher in more general terms than it is for specific individuals (difference of seven percentage points.) For other values, there is an even greater gulf between general and personal relevance. This is often in the double digit range for performance-related values. One example of this is the value of competition: Almost one in every two respondents assign this value increased significance, but just 14% believe that this is gaining in importance for them on a personal level – a huge difference of 35%. Performance and power (differences of 29 percentage points in each case) and luxury (19 percentage points) also clearly show that general and personal perceptions of increased importance are miles apart. Clearly, we tend to view performance-related values as important in general today, but do not believe this shapes our own lives to the same extent. Perhaps we just assume that we have already achieved enough, while we wish others would be a little more intense and resilient. The differences are slightly less extreme for adventure (11 percentage points), responsibility (10 percentage points), solidarity (9 percentage points) and going without (7 percentage points), but the estimated increase in importance for all of these values is higher for society as a whole than for individuals specifically. Respondents only assessed optimism as being equally important for both society as a whole and individuals (difference of 0 percentage points). The tables are actually turned when it comes to the values for home and trust: More respondents thought that seeking solace in their own four walls and having confidence in themselves, others or the future were more important in personal terms than for society in general. adventure than others and seek out new experiences. And with all their motivation it seems they feel that they are allowed to enjoy themselves every now and again: Luxury is playing an increasingly important role for 14% of respondents in this age group, the highest value across all age groups included in the survey. 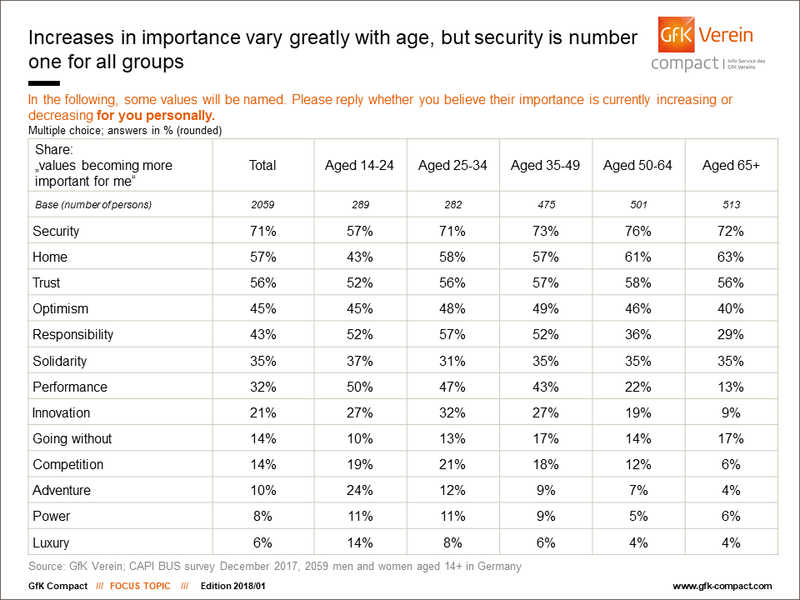 The issue of security takes top spot, as is the case for all other age groups. However, just 57% of young respondents believe that we will need more security in future, which is very low in comparison with other age groups. Taking refuge in their own homes is also evidently less often seen as important for younger respondents: Only 43% believe this to be a value of the future, although this figure increases noticeably with age. This starts as early as the 25 to 34 year-olds: 58% are of the opinion that their own homes will become more important in future, which is in line with the national average in Germany. However, an above-average proportion of this age group focuses on values such as responsibility (57%), performance (47%), innovation (32%), competition (21%) and power (11%). Clearly these performance-related values depend above all on the stage of life during which the respective respondents really start their career. However, social aspects such as trust and solidarity are just as highly ranked – or very nearly, anyway – as they are for all age groups. At a time when many of us are preoccupied with parenting, responsibility is still important (52%), while inclination to go without also increases. A total of 17% of 35 to 49 year-olds reckon that they personally should go without something. Along with the 65 year-olds, this age group records the highest value for going without. However, this generation doesn’t let this dampen their spirits: Optimism is a future value for 49%. The group of 50 to 64 year-olds also shares this positive worldview to a certain extent. However, their focus is above all on safety, which is particularly important for this age group, at 76%. Homes also gradually become more important at this age. In contrast, the 50 to 64 year-olds assign significantly less value to performance and responsibility. Respondents over 50 evidently take the view that they have already paid their dues many times over and can now concentrate on new projects. Those of us who are slowly creeping into retirement age may well often think about how our twilight years will pan out. Will we receive any support? Will we have to leave our own home? It should come as little surprise, then, that home is valued the highest by the over 65s in comparison with other age groups. Moreover, 63% are certain that this value will become more important in future. Simultaneously, this generation also seems to be aware of the fact that as they get older, a more frugal lifestyle is required. While going without is seen as relevant for just 17% of this generation, and therefore not a majority, this is still the highest assessment for this value across all age groups. In contrast, performance-related aspects play the least significant role for this age group: Over 65s pay little notice to performance, competition and innovation. Irrespective of whether on a general or personal level, the values we focus on do not stay the same, but instead change over the course of our lives. 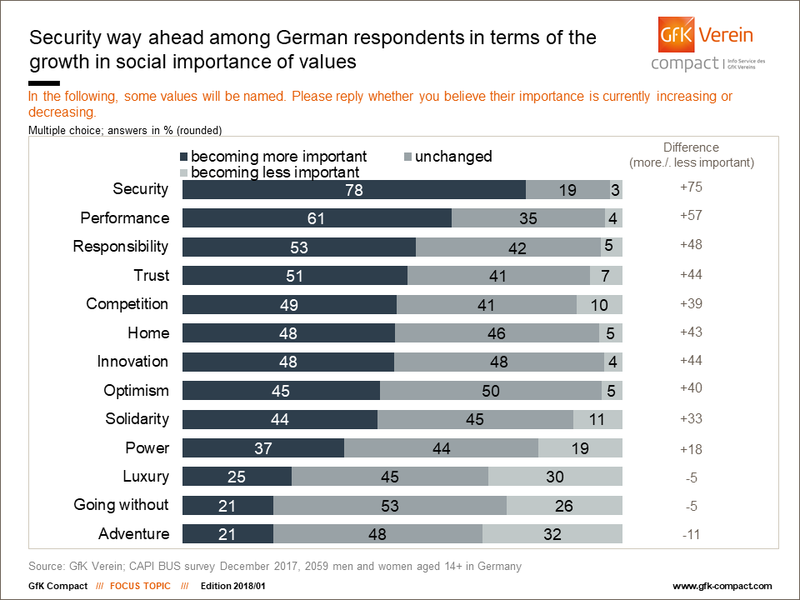 And perhaps the value system for Germans will change again this year, and 2019’s survey will look completely different. Maybe security will continue to gain importance in people’s lives, but perhaps power aspects or even social values will experience a renaissance. This will all depend on the events which shape the year to come for Germans. Nobody yet knows what will happen exactly, but as the French author Antoine de Saint-Exupéry said: “As for the future, your task is not to foresee it, but to enable it,” – in spite of all uncertainty. If you have any queries concerning GfK Compact, please contact Claudia Gaspar (claudia.gaspar@gfk-verein.org). Do you want to be informed as soon as a new Focustopic is available? Here you can sign up with your email.